What golfer wouldn't want to be surrounded with some good old golfing plaid? It's the perfect thing for Dad or Grandpa when they go out on the golf course! The background in this design is a diagonal plaid that has muted green, red, cream, and yellow. 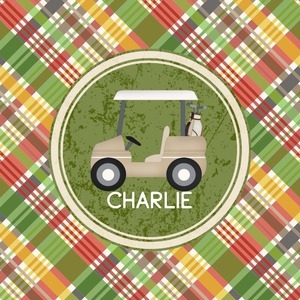 In the center is a fun vintage texture frame with a golf cart illustration and your personalization underneath. The coordinating design has a fun golf ball pattern with a victorious laurel wreath framing your personalization. This is the perfect design for any guy who loves golf. Be sure to check out our other golf patterns and graphics while you are in our design center. We have so many other graphics and patterns to choose from as well! You are in control, so you get to decide exactly how and what to design. Have fun and let us know if you need any help!